A number of Grace Brethren leaders and pastors are attending the “Exponential” conference this week in Orlando, Florida (Tom Avey cellphone photo). Fellowship Coordinator Tom Avey reports, “Jesus told them to make disciple ‘as they go.’ But they had to wait on the Holy Spirit. Then the Spirit came, they spoke and thousands came to faith in Christ. “In obedience to Jesus’ commission and the work of the Spirit, local churches were formed. Church planting is tied to the Great Commission. 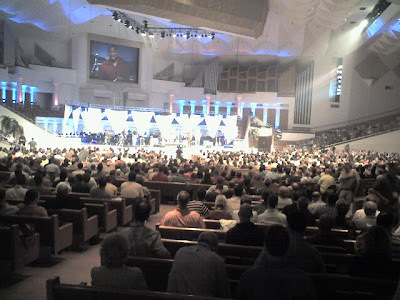 The FGBC has always valued church planting. Pastor Ed Waken from the Phoenix area also notes “Thanks for encouraging and informing all about Exponential ’08. I just wanted you to know that Neil Cole will be doing two workshops. “Not only do we have a large group going to learn more about exponential growth, one of our own is a leader of exponential thinking (and the workshops are sold out! ).